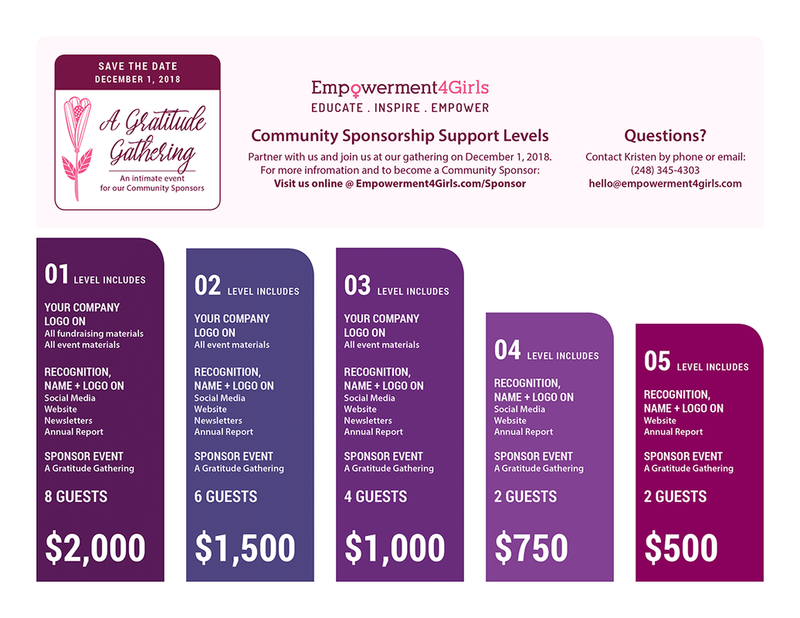 We invite you to partner with us in our vision and commitment, to educate, inspire and empower girls and womxn, by becoming a Community Sponsor of Empowerment 4 Girls. Complete our CMCB Curriculum by the end of 2018 and offer our first camp next summer. Complete our first Teacher Training for our Empowerment Camps and offer our first training in fall of 2020. Continue to grow and develop our organizational capacity in order to offer our programing to more girls. We will publicly acknowledge you through our website and event promotional materials. Sponsors who donate $2,000-$500 are invited to join us at our annual Gratitude Gathering on December 1, 2018. We are a collective of community educators working together through our Empowerment Camps, Conscious Minds Conscious Bodies™ Sexual Education Program, and Teacher Training Programs to educate, inspire and empower girls and women. Empowerment Camps have been available to girls ages 9-16 in Thurston County since 2012. We are currently developing our Conscious Minds - Conscious Bodies™ (CMCB) and Teacher Training curricula. We’re committed to our mission and developing sustainable policies and procedures that support compliance and transparency in our work and financial practices. Building a strong foundation ensures that we will continue to deliver life-changing curricula to our Thurston County community and beyond. We appreciate your consideration to partner with us to provide programs that make a difference. If you are ready to partner with us, use the links above to get started. If you are unable to become a Community Sponsor and would like to support our mission by donating your skills, time or money, please visit us @ Contribute. Together, we are growing stronger girls and building a stronger community. We're proud to partner with these businesses and individuals—community helping community.